With just three games to go now, there were good wins for Newbold, Saints and Rugby Welsh on Saturday, but Lions and Old Laurentians both suffered big defeats. Newbold were back on track with a 26-5 victory over sixth-placed Hereford at Parkfield Road. But they are still third in Midlands 1 West, agonisingly just a single point behind Dudley Kingswinford, who enjoyed a 33-5 away win over Old Halesonians in seventh. Bromsgrove’s 107 points can’t be caught at the top of the table, so it’s all about who gets the runners-up spot. Whitchurch are also hoping DKS slip up as they are level with Newbold on 87 points, in fourth spot after their 43-12 win over tenth-placed Sutton Coldfield. This Saturday’s hosts Longton are down in 12th place, but managed a 42-36 win at bottom club Moseley Oak at the weekend. Newbold’s final two games of the season see them host Malvern on April 6 and travel to Moseley Oak on April 13. Rugby Lions knew they would be in for a tough time against Midlands 1 East leaders Kettering, who have a nine-point gap over chasing Paviors, 103 to 94. After an early onslaught Lions fought back to finish 24-54 at Webb Ellis Road and collect the four-try bonus point. Lions are still 11th in the table on 43 points, safely clear of the three below, next week’s opponents Leighton Buzzard who have 21, Northampton Old Scouts on 10 and final game hosts Melton Mowbray on 4. Leighton Buzzard go into the game recovering from a 33-12 defeat by fifth-placed Peterborough. Lions other remaining fixture is a home derby against sixth-placed Lutterworth on April 6. Old Laurentians found themselves on the wrong end of an unexpectedly large scoreline, going down 61-15 at home to Barkers Butts, who now move up to fifth spot. OLs are still second in Midlands 2 West (South) looking to secure the the play-off place. But they are level on 75 points with Kidderminster, who beat Southam 50-5 at the weekend. 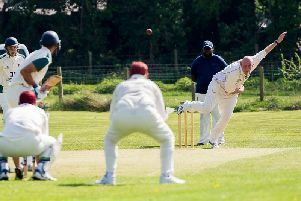 Kenilworth are virtually guaranteed the title on 89 points and will round-off their season at home to OLs on April 13. On Saturday OLs travel to sixth-placed Earlsdon, who had a narrow 24-22 win over struggling Old Coventrians. Their April 6 visitors to Fenley Field will be Evesham. There was joy at John Tomalin Way for Rugby St Andrews, who won 31-18 against Silhillians, who are now seventh. Although Saints are still bottom of Midlands 2 West (South) on 24 points, they are just one point behind the three teams above them, Southam, Old Coventrians and Evesham, who are their hosts on April 13. Before that Saints welcome Earlsdon on April 6. Barkers Butts are this Saturday’s hosts, no doubt also buoyed by their win over OLs. Rugby Welsh enjoyed a strong 47-12 win at Keresley in Midlands 5 West (South). League leaders Birmingham Exiles are the visitors to Alwyn Road on Saturday, looking to cement their claim on the title. Their last league game on March 2 saw them beat bottom club Atherstone, a hefty 61-0. With just five teams left in the division this season, Exiles have 40 points, Birmingham Civil Service 34, Welsh 27, Keresley 21 and Atherstone 5. Welsh finish their campaign at Civil Service on April 6 and host Atherstone on April 13.